After reading this story by Brett Boese on the front page of today's Rochester Post-Bulletin, I wanted to know more about senescent cells. NPR covered the same story yesterday. Here's the NPR link with optional audio. According to this recent Mayo Clinic study covered in those stories, the elimination of senescent cells can increase the lifespan of a mouse by up to 25-35%! That's a lot! But - my big question - what the heck is a senescent cell? Broadly, senescence refers to the aging process. But cellular senescence is something different. Senescent cells are cells in the body that have experienced a specific change to their normal state. Once this change occurs, they can't multiple at a normal rate, and they gradually start to collect and cause problems. Specifically, the pile-up of senescent cells can cause inflammation. Inflammation is a root cause for many human ailments. 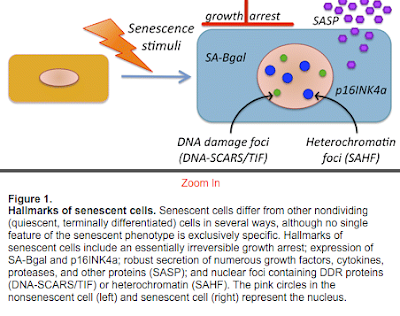 Cellular senescence is caused by a variety of factors related to DNA damage, genotoxic stress, and other not-yet-understood factors. When cellular senescence occurs and cells stop dividing properly, they mess with their neighboring cells and cause "cell drama." Cell drama contributes to a bunch of diseases, tumor development, and the overall aging process. Here's a very helpful article from the Journal of Experimental Medicine. And a diagram. The story covered by NPR and the Post-Bulletin quotes research showing that by giving mice a drug which reduces senescent cells, mice live longer. The authors of the study mention that the research they are doing will hopefully lead to drugs which will do the same things in humans. In a lot of ways, that's super exciting - both for Mayo and for humans.